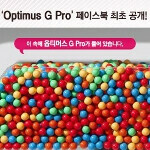 LG's Korean Facebook page confirmed that the version of the LG Optimus G Pro for the hometown Korean market will not only be 5.5 inches, matching the Samsung GALAXY Note II, it will also be LG's first Full HD panel. You might recall that the version of the phone launching in Japan will be capped at 5 inches. It's all a bit confusing, but if you just try to remember that the device will be 5 inches in Japan and 5.5 inches elsewhere, you won't go wrong. 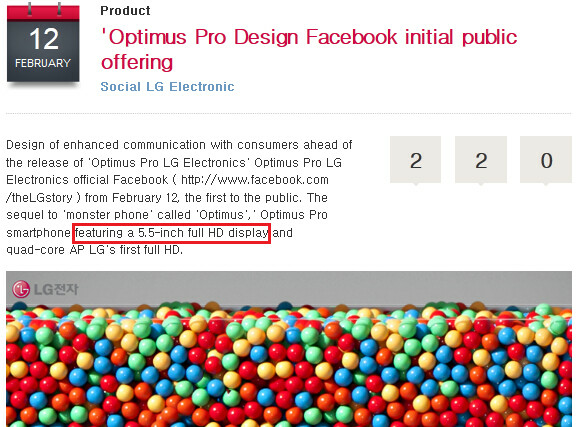 Speaking of LG's Facebook page, the firm is revealing a little more information on the LG Optimus G Pro for each"Like" that it gets on the site. The picture accompanying this article shows a number of colored balls that will apparently start to disappear to show more about the device. What we do know is that the LG Optimus G Pro will have a pixel density of 401ppi which beats out the Apple iPhone 5, the Samsung Galaxy S III, the BlackBerry Z10, but is less than the HTC DROID DNA and the Huawei Ascend D2 to name a couple. The quad-core 1.7GHz Qualcomm Snapdragon S4 Pro APQ8064 is under the hood with the Adreno 320 GPU crunching the graphics. We expect to see 2GB of RAM and 32GB of native storage which can be expanded by as much as 64GB using the microSD slot. A 13MP camera captures video at 1080p and there is a 2MP front-facing camera for self portraits and video chat. And the thing is, while 5.5 inches surely seems pretty big now, the Samsung GALAXY Note III could be 6.3 inches which could take the "wow" factor down a bit. Can't wait to buy this BEAST!!! Come on, start liking the page so we can see it all. am I the only one here who feels 5''+ for a mobile screen is just too much..!! I'll have to say that HTC did the best thing with the M7 (HTC One, if the rumors are true). 4.7'' F-HD...!! !